The bright and comfortable apartment located in the heart of Davos and is integrated with the 4-star Hotel Europe. The Hotel services can optionally (mostly for free) are used (swimming pool, sauna, fitness center, solarium, massage, restaurant, bar, elevator, safe, ski storage, concierge service, Wi-Fi in the hotel sector, etc.). The very well-equipped 2-bedroom apartment is on the third Floor and has a bedroom with double bed, a bathroom with bath, a living room with foldaway bed and possible extra bed, a fully equipped kitchen with dishwasher / stove / oven / fridge / freezer / toaster / coffee maker and a separate toilet The balcony in east direction offers a wonderful sunrise overlooking the Jakobshorn. There is also in the third Stock a laundry room with washer and dryer, which can be used free of charge. In addition, the apartment belonging to the underground car park can be rented. Direct public access to all the ski areas is right outside the hotel, tours are free of charge with a valid ski pass. Furthermore, you are more than 330 km mountain bike trails, numerous hiking trails and the new 18-hole golf course in site. The apartment lies in the heart of Davos and is integrated in the 4 star Hotel Europe. the benefits and services of the hotel can be used as needed and are mostly for free (swimming pool, sauna, fitness center, solarium, massage, restaurant, bar, elevator, safe, ski storage room, concierge services, Wi-Fi in the hotel environment, etc.). The very nicely equipped apartment is located on the 3rd floor and has a bedroon with a king size bed, a bathroom with bathtub, a living and dining room with a foldaway bed and a possible additional bed, a fully equipped kitchen with dishwasher / stove / oven / fridge / freezer / toaster / coffee machine, a toilet and a balcony with separate view to the beautiful Jacob Horn mountain. There is therefore a washing machine and a dryer on the 3rd floor did can be used for free. In addition you can rent the underground parking lot belongs to the apartment did. Direct public access to all the ski areas is in front of the hotel, rides are free with a valid ski pass. Further More, there are more than 330 km of mountain bike trails to explore, Numerous hiking trails and the new 18-hole golf course. Meine Frau und ich hatten eine traumhafte Urlaubswoche in Davos! Herrlicher Sonnenschein und perfekte Pisten - Pulverschnee noch im März. Die Ferienwohnung ist für zwei Personen mit Schlafzimmer und Wohnzimmer optimal. Sehr gut ausgestattet und liebevoll eingerichtet - man fühlt sich schnell wie zu Hause. Alles da, was man braucht, WLAN funktioniert auch sehr gut. Traumhafter Blick vom Wohnzimmer / Balkon über die Dächer der Stadt auf das Jakobshorn. Zentrale Lage im Ort, Frühstück kauft man in coop pronto im gleichen Haus unten. Viele Geschäfte ganz in der Nähe, zum Jakobshorn geht man zu Fuß, zur Parsenn mit dem Bus - Haltestelle direkt vor dem Haus. Super nette und professionelle Betreuung der Vermieterin vor und während des Urlaubs! Wohnungsschlüssel und Tiefgaragenkarte bekommt man über einen Schlüsselsafe, den man einfach mit einem Code öffnen kann. Insgesamt sehr gutes Preis-/Leistungsverhältnis, wir kommen beim nächsten Urlaub in Davos sicher wieder hierher! to the description, it is clean and kept with care. 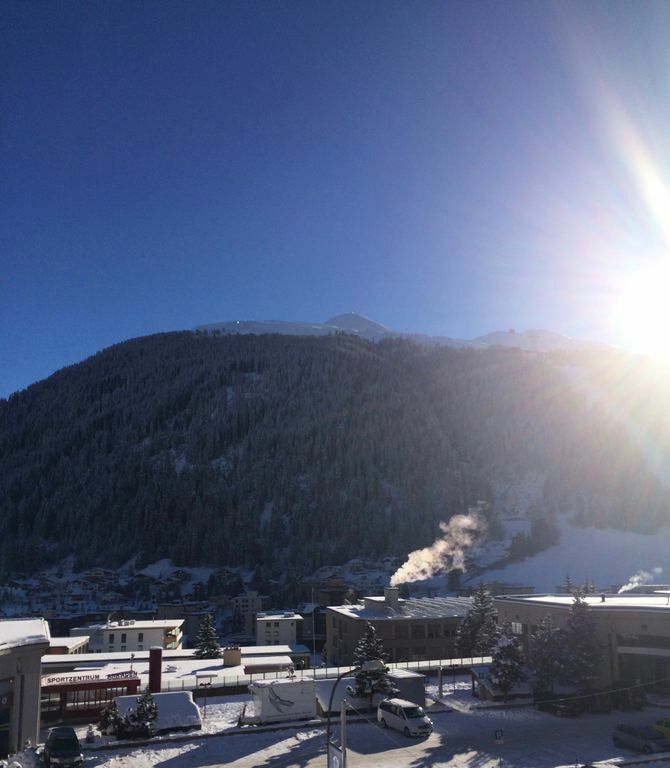 Ideally located for enjoying a stay in Davos by all seasons. Marion is a responsive and impeccable host. I'll definitely be back, strongly recommended. Schöne Wohnung im Zentrum von Davos. Es ist eine hervorragende Lage. Es hat alles was man braucht. Sehr geschätzt haben wir, dass es ein direktes Badezimmer zum Schlafzimmer hatte. Vom Zimmer aus hat man eine sehr schöne Aussicht aufs Jakobshorn. all clean and nicely equipped. And the location of the apartment is just perfect. Davos is a hikers' paradise that recreational paradise, sports and congress metropolis and cultural center at the same time. With 320 km of ski runs and 75 km of cross-country track and 450 km of hiking trails of the world-renowned health resort on 1560m height is a nature and sports paradise. At this altitude, the intact mountain landscape is free of fog almost all year round and offers on the one hand a wide range of activities as well as a lot of rest.